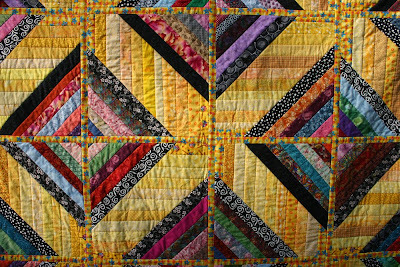 I can not even remember how I came across The Blogger's Quilt Festival hosted by Amy's Creative Side...I have grabbed moments here and there through the day to visit quilting blogs and see what there is to view...for the most part I have not commented because I didn't have a post ready for it. And had not planned to do one till a friend pointed out that it is open till May 28th. If you want to join or just view some quilts and hear their story, click on the badge below. One of the rules is to tell a bit about the quilt and why it is special to you. So here goes. This is my River of Light quilt. I started it when I still worked at the apple orchard....I wanted to sew sometimes but was too tired to do anything that required thinking. I decided to make a string quilt in the quilt as you go method. I cut the backing and batting foundation over-sized. I drew two diagonal lines with a chalk marker to help me with the placement of the yellow. I did not measure at all when marking the lines...just threw my ruler down and ran the chalk marker along the ruler. The only real restriction was I wanted the last yellow on each corner/end to be the same one. And a black and white print was to go next to the yellow. I think I cut the strips anywhere from 1 1/4 to 2 inches wide. As I sewed each strip to the previous strip, I would pull the thread up from the bottom and tie it in a knot, trim the ends, then press the strip open. I just used old fabrics that I didn't especially like for the backing...just to use them up. If I had known I would like the quilt as much as I do, I might have planned the backing a bit better. After all the blocks were done, I made borders by a method similar to making the blocks. Then I made the little sashing strips to connect the blocks. So this is my first entry for the Blogger's Quilt Festival...I have shown this quilt before but I do really like it....I think it is special to me because I really had not planned on liking it so much. Absolutely gorgeous, Rose.. I love it --and love all of your colors. I'm so glad you are entering the Bloggers Quilt Festival. That is SUPER... I'm so proud of you. What a cheery quilt - great quilt-as-you-go method. Did you hand or machine quilt it? Wow, I love it! The colors are so pretty. Thanks for showing it. River of Light is such an apt name for this quilt. It's gorgeous! Really fantastic. I have a thing for string quilts. I like the pattern of the quilt very much. I don't grasp the intricate parts of the process, but luckily one doesn't need that to enjoy the end result! I love this Rose! I wish I could have you demonstrate the process for me....especially how to put them together after the blocks are done. I didn't understand that part about pulling up the bottom thread and tie it in a know. I'm glad you showed this! I think it's a very pretty quilt, Rose. I'm amazed that you were able to do this even though you were very tired. Very beautiful Rose! Like I've said before....you inherited mom's talent when it comes to sewing. That is really very pretty. I'm glad you like it so much now! Rose: So nicely shown and made, you did a wonderful job on the quilt.. I just absolutely love string quilts and this one is using the strings in the center like I've never seen before and I love it! The gold/yellow really makes it a standout! What a wonderfully warm quilt. I love how you placed the yellows through the quilt. I understand why you like it so much. It is just so charming and endearing. This is stunning, Rose. You are not merely a quilter, but an artist! Fantastic work. I cannot comprehend doing such a thing! I can understand why you like this quilt so much. Not only is it your first, it is absolutely beautiful. A lovely scrappy quilt! I like the yellow sashing between the blocks which I didn't notice at first glance. I've just finished a quilt as you go log cabin and like you, made the backing up with fabrics in my stash that needed using. Thanks for sharing! It is absolutely gorgeous & I like it that you have sashing in between which makes everything stands out! stunning quilt! I really like the back too0I like the look of big squares of different fabrics together. wonderful job! I am a big fan of string quilts. This is the first time I have seen this combination of two different directions of strings in one block. Did you invent it? All the golden and yellows makes it so sunny and happy. Lovely quilt, enjoy it! I love it! I especially like quilts with pieced borders, and yours is sooo colorful!! 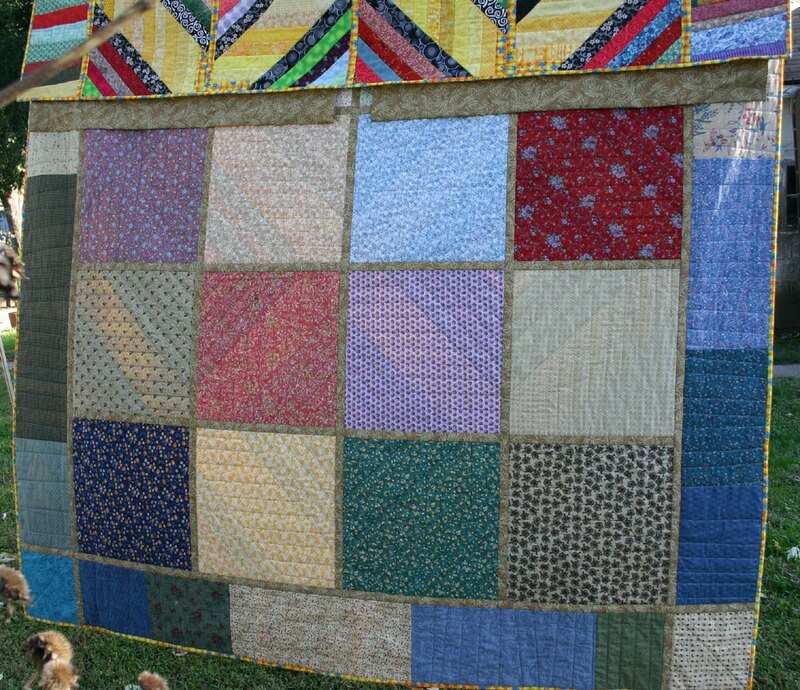 I hav never made a string quilt and am so impressed with yours. Thank you so much for leaving a comment on my blog for my entry in the festival. Hi Rose, Thanks for stopping by my blog and commenting on my fesival quilt. Your exhibit is wonderful. 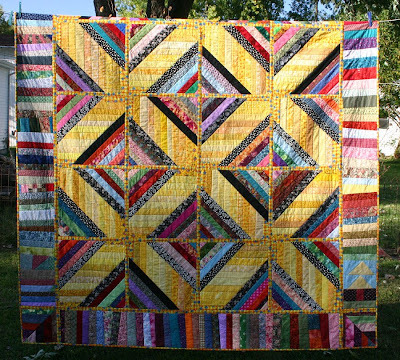 I am a big fan of string quilts to start with, but the beautiful yellow you have used in this makes it extra special. Perfect name for the quilt too. WOW..this quilt is spectacular in color, line and especially execution. It reminds of the powerful graphic qualities that drew me to quilting way back when. thank you for sharing this with us all. That is a unique and really beautiful quilt. I love the strings going in two different directions and the vivid colors! This is wonderful. Lovely entry! Wow. this is a beautiful quilt, Rose. Well done! What a great quilt and a fabulous name that captures the feel of the quilt perfectly. I've always wanted to do a quilt as you go, but was always a little afraid. You've definitely inspired me now! I love the picture at the top of your blog - I used to live out in the country *sigh* I really miss that life a lot. Stunning quilt. Lovely design, fun fabrics & colors. Great job. That's a beautiful quilt, Rose. Scrap quilts are my favorite! Wow. That yellow is beautiful. It's gorgeous, I love it. What a CHEERFUL and FUN quilt! It is SO happy!!! I love your story and your quilt. : ) Thanks for sharing! Thank you also for visiting my blog and leaving a comment. I appreciate your visit! Enjoy the BQF! this is a fantastic quilt--love the yellows in it! i really like all of it, especially love the sashing you did, and you border is a nice compliment. Rose, I love this! So bright and cheery! Beautiful quilt! I love how you put the yellows together. I absolutely love this quilt! It's fantastic!So glad you posted in the bloggers quilt festival. I love it! So bold and colorful! Thanks for stopping by my blog! Wow--what a fun happy quilt! Great quilt. Love those yellow bands. 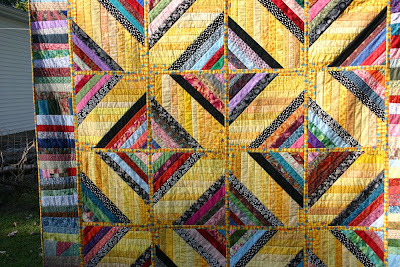 LOVE the way you stepped outside of traditional string piecing and did your yellows at the 90 degree angle -- way cool effect!